Roses tumble over the Anglican church in Menton. I'm pretty sure that rose is called Sénateur La Follette as I have it in my own garden. Lovely isn't it? 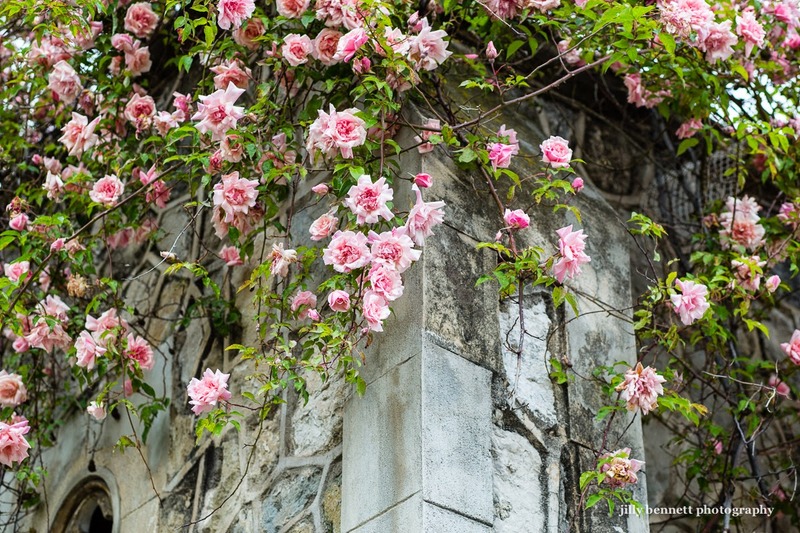 Les roses croulent sur l'église anglicane de Menton. Je suis sûre qu'il s'agit de roses appelées Sénateur La Follette comme celles que j' ai dans mon propre jardin . C'est beau, n'est-ce pas ? Robert La Follette was a progressive senator from Wisconsin in the early 20th Century. He was a strong advocate for working men and women. Some consider him one of the greatest senators in the history of the US Congress. Pink, maybe, but not soft. You have such a great eye for this kind of photo, Jilly. Thanks to Bob for providing more info about Robert La Follette. That's interesting! What a lovely rose tree. I might get one for Michel, he loves roses.